We’re all human. We all make mistakes. What’s important is that we learn from the mistakes we make. Comprehensive Healthcare Revenue Management (CHRM) prides itself in minimizing mistakes made and learning from our mistakes. As a leader in medical billing, CHRM understands the costliness of medical coding errors. We do our utmost to minimize these errors through training our staff on the most common errors made as well as the proper codes to use. Below, we offer up tips we’ve learned for how to reduce medical billing errors. Verify all patient information. Making sure you have the name, address, social security number, birthday, and the correct insurance information is vital in patient billing. Even a transposed policy number can result in months of delay in collection from the insurance company, impacting the bottom dollar and the overall revenue cycle. Invest in training. Make sure all staff members are aware of changes in any insurance processing or applicable healthcare laws, which impacts compliance and, ultimately, fines if found to be in violation. Reduce duplicate claims. Duplicate claims is when a claim is resubmitted for the exact same service already previously billed for. Not only is this a waste of staff resources and staff’s time, but this can also result in the insurance company denying both claims. Get pre-authorizations for treatment. One of the most costly medical billing errors is submitting claims to insurance companies when the patient’s policy does not cover the procedure, resulting in denials. This wastes valuable resources such as staff’s time (not to mention an angry patient who may have been under the impression his or her service was covered, especially if it was an elected service and not medically necessary) when a simple phone call could have been made. Filing on time. Many insurance providers have time limits on submissions. Typical for the industry is a 60 to 90 day time limit on the initial claim, and, if the claim is denied, an additional 45 day limit to appeal the claim. Claims not filed on time usually result in write-offs for the medical practice, a costly mistake that can add up quickly. Providers simply need to create a system in which staff receive automated alerts as medical claims approach their time limit. Working together. Collaborating on what works, developing more efficient processes, and asking advice of the medical billing team will result in more solutions found in less time. Specialize. 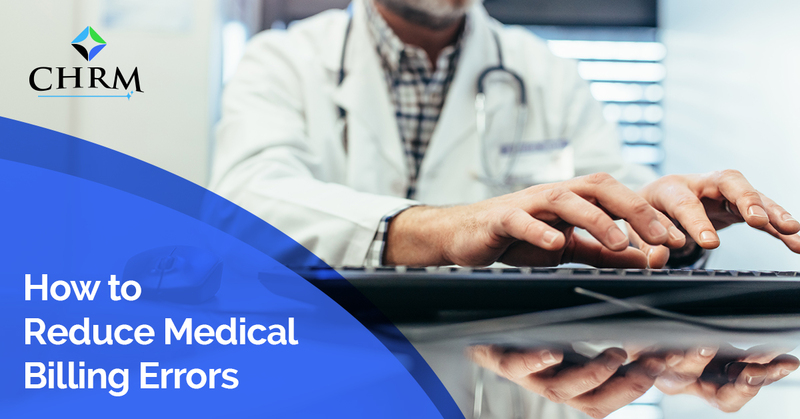 Having certain medical coders only do one part of the process or one part of the practice can speed up claims and eliminate errors caused by the wrong code being used. No doubt medical billing can be complicated. It’s a whole other language that must be mastered — and quickly if you’re in charge of medical billing for your practice — that, if done wrong, can cost thousands of dollars. Mastering thousands of codes that can change is a challenge for anyone. CHRM utilizes technology to help us minimize errors. Coding errors or usage of outdated codes can result in delays or even denials. Our billing system checks for current codes and notifies us if there is an error before we submit the claim. Our staff receives alerts as to when medical claims may be approaching their time limit. We divide our staff into departments: oncology billing, free-standing emergency services, physician billing, hospital billing, and orthopedic surgeon billing. This enables us to become experts in the coding of one medical practice, which eliminates errors. Medical billing mistakes result in loss of reimbursement and the practice losing revenue. Errors in Medicare and Medicaid billing are taken very seriously by the federal government and can actually result in the practice not being allowed to bill if negligence is determined to have occurred. Medical billing errors are also costly to the patients as they may be paying more for a service they didn’t receive, and if that patient sees another doctor, the diagnostic code could be confusing for the new medical practitioner. Hiring a professional medical coder can be one of the best decisions you make for your medical practice. A professional medical coding service stays up to date on compliance and laws as well as offering a dedicated staff at your disposal. Comprehensive Healthcare Revenue Management provides quarterly and monthly reporting on your billing, collection, and cash flow processes. We submit claims daily, follow up on all denials, and manage appeals. We answer all your practice’s billing questions and track patient co-pays and insurance payments made. We monitor the submission times and stay within that to virtually eliminate write-offs due to a missed deadline. And, best of all, we care about your practice and do our best to maximize your revenue cycle. Guided by transparency, honesty, integrity, and excellence, you’re in good hands with CHRM. Contact us today for all of your medical billing service needs!